Another fabulous recipe from Baked Elements! 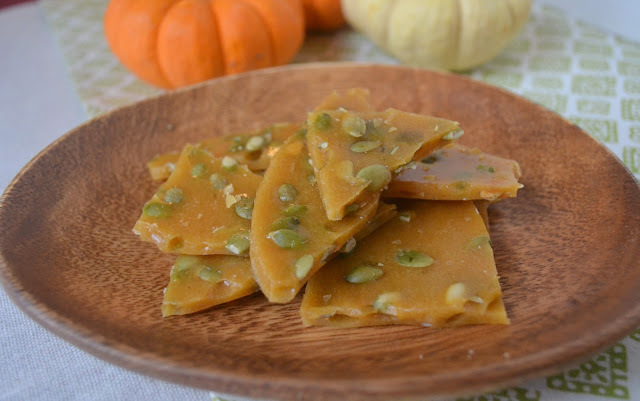 I was intrigued by the Pumpkin Seed Brittle recipe as I was excitedly skimming the book for the first time I didn't expect to like it as much as I did. A seasonal cousin to the classic peanut brittle, this one makes use of raw pumpkin seeds, or pepitas. I've avoided making brittles in the past and can only assume that the remainder of the recipe is fairly consistent with other recipes. As far as candy making goes, this is pretty easy. Basically toast the seeds, or buy them pre-toasted, boil some sugar, and spread onto a pan. Not a candy thermometer in sight. Let me just say, this stuff is addictive! Caramely, crunchy, slightly salty, and warm from the addition of cinnamon. While I appreciate cinnamon, it's not a flavor that I'm particularly drawn too. Maybe it's the recent drop in temperature outside, but it's the warmth of the cinnamon that keeps me reaching for another piece of this stuff. To get this fabulous recipe and see what the rest of our group thought of this week's challenge, please visit Baked Sunday Mornings. And if you haven't done so already, please check out my facebook page. Thanks! Your brittle looks great! I agree about the addictiveness; I am tempted to have a piece whenever I walk into the kitchen. I think the cinnamon in this brittle is a stroke of genius! Even without the pumpkin seeds, the flavor screams fall... and it is addictive! Great job! I agree, Candy. I think it's the sweet/salty/crunchy combination! And, I just read how wonderful pumpkin seeds are for us - just in case we need any further justification! Very nicely done! I couldn't stop eating this. I love the salty sweet combination. Yours is a lovely color! I love the lighter, buttery color of your brittle! Looks great! Yours looks like it came out great!